Exactly! NGDP targeting is exactly in the spirit of Friedman. See David’s take on Woodford here and here is what Scott Sumner has to say. Central bankers should adopt a clear policy goal, such as the path for nominal gross domestic product, to make remaining easing options more effective under the limits of near-zero interest rates, according to Michael Woodford, a professor of political economy at Columbia University. Such criteria would increase the impact of efforts to reset public expectations for interest rate policy, such as asset-purchases, Woodford said. Federal Reserve policy makers have kept the benchmark rate near zero since December 2008 and this month reiterated a plan to keep borrowing costs at record lows through at least late 2014. “A more useful form of forward guidance, I believe, would be one that emphasizes the target criterion that will be used to determine when it is appropriate to raise the federal funds rate target above its current level, rather than estimates of the ‘lift-off’ date,” Woodford said in a paper presented today at the Fed’s annual symposium in Jackson Hole, Wyoming. “But if a central bank’s intention in announcing such purchases is to send such a signal, the signal would seem more likely to have the desired effect if accompanied by explicit forward guidance, rather than regarded as a substitute for it,” Woodford said. “A more logical policy would rely on a combination of commitment to a clear target criterion to guide future decisions about interest-rate policy with immediate policy actions that should stimulate spending immediately without relying too much on expectational channels,” Woodford said. The Fed has carried out two rounds of bond purchases known as quantitative easing to reduce borrowing costs. In the first round starting in 2008, the Fed bought $1.25 trillion of mortgage-backed securities, $175 billion of federal agency debt and $300 billion of Treasuries. In the second round, announced in November 2010, the Fed bought $600 billion of Treasuries. Policies that target specific credit areas, such as buying mortgage-backed securities, or the Bank of England’s Funding for Lending Scheme, may be more effective at boosting spending, though they are “more properly” viewed as fiscal as opposed to monetary stimulus, he said. Lets just say I agree with the policy recommendation – even though I certainly do not think US monetary policy is accommodative just because the fed funds rate is low. Update: My fellow Market Monetarists David Beckworth (who is quoted in Woodford’s paper) and Marcus Nunes also comment on Woodford. I am going to Russia next week. It will be good to be back in wonderful Saint Petersburg. In connection with my trip I have been working on some econometric models for Russia. It is not exactly work that I enjoy and I am deeply skeptical about how much we can learn from econometric studies. That said, econometrics can be useful when doing practical economics – such as trying to forecast Russian growth and inflation. So I have been working on this model for the Russian economy. The main purpose of the model is to learn about what I would would call the petro-monetary transmission mechanism in the Russian economy. It is my thesis that the primary channel for how oil prices are impacting the Russian economy is through the monetary transmission mechanism rather than through net exports. Here is my theory in short: The Russian central bank (CBR) dislikes – or at least used to dislike – a freely floating exchange rate. Therefore the CBR will intervene to keep the ruble stable. These days the CBR manages the ruble within a band against a basket of the US dollar and the euro. Today the ruble is much more freely floating than it used to be, but nonetheless the ruble is still tightly managed and the ruble is certainly not a freely floating currency. So why is that important for my econometric models for Russia? Well, it is important because it means quite a bit to the causality I assume in the model. Lets look at two examples. One where the ruble is completely pegged against another currency or a basket of currencies and another example where the ruble is freely floating and the central bank for example targets inflation or nominal GDP. If we are in a pegged exchange rate regime and the price of oil increases by lets say 10% then the ruble will tend to strengthen as currency inflows increase. However, with a fully pegged exchange rate the CBR will intervene to keep the ruble pegged. In other words the central bank will sell ruble and buy foreign currency and thereby increase the currency reserve and the money supply (to be totally correct the money base). Remembering that MV=PY so an increase in the money supply (M) will increase nominal GDP (PY) and this likely will also increase real GDP at least in the short run as prices and wages are sticky. So in a pegged exchange rate set-up causality runs from higher oil prices to higher money supply growth and then on to nominal GDP and real GDP and then likely also higher inflation. Furthermore, if the economic agents are forward-looking they will realize this and as they know higher oil prices will mean higher inflation they will reduce money demand pushing up money velocity (V) which in itself will push up NGDP and RGDP (and prices). Now lets look at the case where we assume a freely floating ruble. If we assume that the CBR introduce an inflation target and let the ruble float completely freely and convinces the markets that it don’t care about the level of the ruble then the causality in or model of the Russian economy changes completely. Now imagine that oil prices rise by 10%. The ruble will tend to strengthen and as the CBR is not intervening in the FX market the ruble will in fact be allow to strengthen. What will that mean for nominal GDP? Nothing – the CBR is targeting inflation so if high oil prices is pushing up aggregate demand in the economy the central bank will counteract that by reducing the money supply so to keep aggregate demand “on track” and thereby ensuring that the central bank hits its inflation target. This is really a version of the Sumner Critique. While the Sumner Critique says that increased government spending will not increase aggregate demand under inflation targeting we are here dealing with a situation, where increased Russian net exports will not increase aggregate demand as the central bank will counteract it by tightening monetary policy. The export multiplier is zero under a floating exchange rate regime with inflation targeting. Of course if the market participants realize this then the ruble should strengthen even more. Therefore, with a truly freely floating ruble the correlation between the exchange rate and the oil price will be very high. However, the correlation between the oil price and nominal GDP will be very low and nominal GDP will be fully determined by the central bank’s target. This is pretty much similar to Australian monetary policy. In Australia – another commodity exporter – the central bank allows the Aussie dollar to strengthen when commodity prices increases. In fact in Australia there is basically a one-to-one relationship between commodity prices and the Aussie dollar. A 1% increase in commodity prices more or less leads to a 1% strengthening of Aussie dollar – as if the currency was in fact pegged to the commodity price (what Jeff Frankel calls PEP). Therefore with a truly floating exchange rate there would be little correlation between oil prices and nominal GDP and inflation, but a very strong correlation between oil prices and the currency. This of course is completely the opposite of the pegged exchange rate case, where there is a strong correlation between oil prices and therefore the money supply and nominal GDP. So what do that mean for my little econometric exercise on the Russian economy? Well, basically it means that I have to be extremely careful when I interpret the econometric output. The models I have been playing around with I have estimated from 2000 and until today. I have done what is called Structural VAR analysis (with a lot of help from a clever colleague who knows econometrics much better than me). Some of the results we get are surely interesting, however, we got one major problem and that is that during the 12 years we are looking Russian monetary policy has changed significantly. In the early part of the estimation period the Russian central bank basically maintained a quasi-pegged exchange for the ruble against the dollar. Later, however, the CBR started to manage the ruble against a basket of dollars and euros and at the same time the CBR would “adjust” the ruble rate to hit changing nominal targets – for example an inflation target. The CBR have had multiple and sometimes inconsistent targets during the past decade. Furthermore, the CBR has moved gradually in the direction of a more freely floating ruble by allowing for a wider “fluctuation band” around the euro-dollar basket. So basically we would expect that causality in the Russian economy in 2000 would be pretty much as described in the pegged exchange rate case, while it today should be closer to the floating exchange rate case. That of course means that we should not expect the causality in our model to be stable causal structure. Econometricians hate that – to me it is just a fact of life or as Ludwig von Mises used to say “there are no constants in economics” (I am paraphrasing von Mises from my memory). This of course is also know as the Lucas Critique. Some would of course argue that we could take this into account when we do our econometric work, but regime changes do not necessarily happen from day to day. Often regime change is gradual, which makes it impossible to really to take into account in econometric studies. And this is one of my problems with econometrics – or rather with how econometric studies often are conducted. They do not take into account regime change and therefore do not take into account expectations. As a result well-known correlations tend to breakdown. The best example is of course the disappearance of the Phillips curve relationship in the 1970s and 1980s. Another example is the breakdown of the causal relationship between money supply growth and inflation in 1990s. So what do I do? Should I give up on my little econometric venture? No, I don’t think so. Econometrics can clearly be useful in determining the magnitude and importance of different shocks in the economy and surely some of our econometric results on the Russian economy seems to be pretty robust. For example over the estimation period it seems like a 10% increase in the oil prices have increased the M2 and nominal GDP by around 2%. That is nice to know and is useful information when you want to do forecasting on the Russian economy. But it would be completely naive to expect this relationship to be constant over time. Rather the Russian central bank is clearly moving in the direction of a more and more freely floating ruble so we should expect the correlation between oil prices one the one hand and M2 and NGDP on the other hand to decrease going forward. Concluding, econometrics can be useful in doing “practical” economics like macroeconomic forecasting, but one should never forget to do the homework on the institutional structures of the economy and one should never ever forget about the importance of expectations. Economic reasoning is much more important than any statistical results. Should small open economies peg the currency to export prices? We have family from New Zealand visiting us in Denmark these days so I have been paying a bit more attention to the Kiwi economy than I normally would – and particularly to Kiwi monetary policy. As I was going through the Reserve Bank of New Zealand’s (RBNZ) website I came across an interesting note on “Fiscal and Monetary Coordination” – a topic, which I have been giving a bit of attention to recently (See an overview of related posts below). What does that mean? Well, first of all the RBNZ is playing a game (in a game theoretical sense) against the fiscal authorities (the NZ government). This is an non-cooperative game and the government is the Stackelberg leader – first the government decides on the level of public spending (and thereby its “contribution” to aggregate demand in the economy). The RBNZ then sets monetary policy “taking fiscal policy into account” to hits the level of aggregate demand that will ensure the RBNZ fulfilling its inflation target. In the note this is called coordination of economic policy. However, that is not entirely correct. The RBNZ (alone!) determines the level of aggregate demand in the NZ economy, while the government determines the budget surplus/deficit and the level of public spending given what the RBNZ already have decided will be the level of aggregate demand. 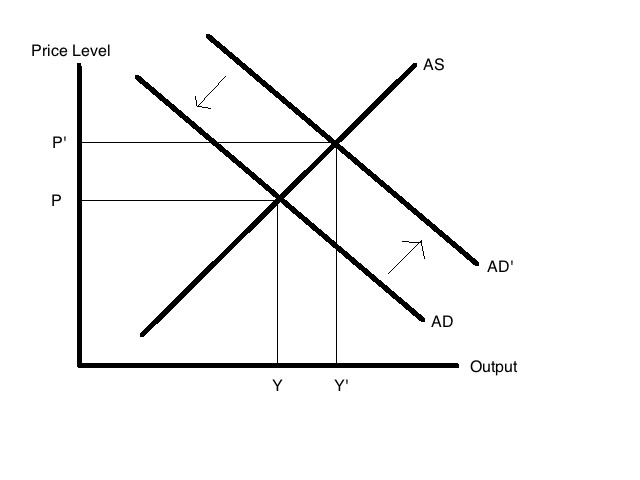 Where M is the “monetary instrument” and A* is the central bank’s target for aggregate demand (NGDP) and F is the “fiscal instrument” (in Nick’s and Simon’s paper this is equation 4). It is very clear from (1) that if government spending is increased to increase aggregate demand then the RBNZ will counteract that one-to-one. This is of course the Sumner Critique – the government cannot increase aggregate demand (NGDP) if the central bank will not play along (assuming quite realistically that the government is the Stackelberg leader). Said in another way the RBNZ’s note demonstrates that the Sumner Critique so to speak is official policy for the RBNZ. There is absolutely nothing controversial about this as it follows directly from the RBNZ being an inflation targeting central bank. However, it do lend support to Scott Sumner’s view that the fiscal multiplier is zero under for example inflation targeting (or NGDP level targeting for that matter) – and this will be the case even in an economy, which is keynesian in nature. 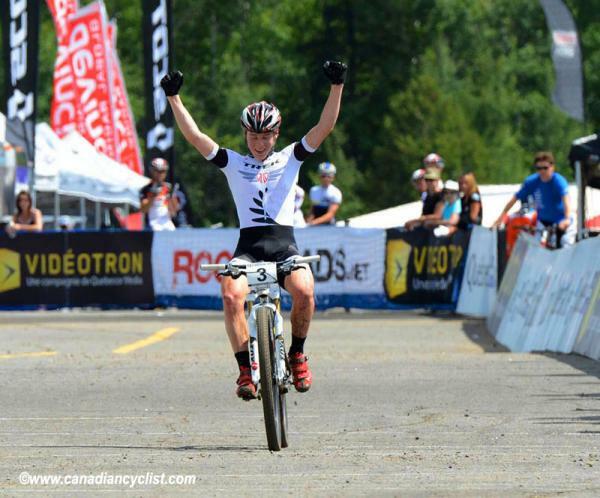 PS The Christensen family will be cheering for Anton Cooper at the Mountain bike World XCO Championships in Austria in the coming week! Market Monetarists have stressed it again and again – the European crisis is primarily a monetary crisis rather than a financial crisis and a debt crisis. Tight monetary conditions is reason for the so-called debt crisis. Said in another way it is the collapse in nominal GDP relative to the pre-crisis trend that have caused European debt ratios to skyrocket in the last four years. I have simply plotted the change in public debt to GDP from 2007 to 2012 (2012 are European Commission forecasts) against the percentage change in nominal GDP since 2007. The conclusion is very clear. The change in public debt ratios across the euro zone is nearly entirely a result of the development in nominal GDP. The “bad boys” the so-called PIIGS – Portugal, Ireland, Italy, Greece and Spain (and Slovenia) are those five (six) countries that have seen the most lackluster growth (in fact decline) in NGDP in the euro zone. These countries are obviously also the countries where debt has increased the most and government bond yields have skyrocketed. This should really not be a surprise to anybody who have taken Macro 101 – public expenditures tend to increase and tax revenues drop in cyclical downturns. So higher budget deficits normally go hand in hand with weaker growth. The graph interestingly enough also shows that the debt development in Greece really is no different from the debt development in Germany if we take the difference in NGDP growth into account. Greek nominal GDP has dropped by around 10% since 2007 and that pretty much explains the 50%-point increase in public debt since 2007. 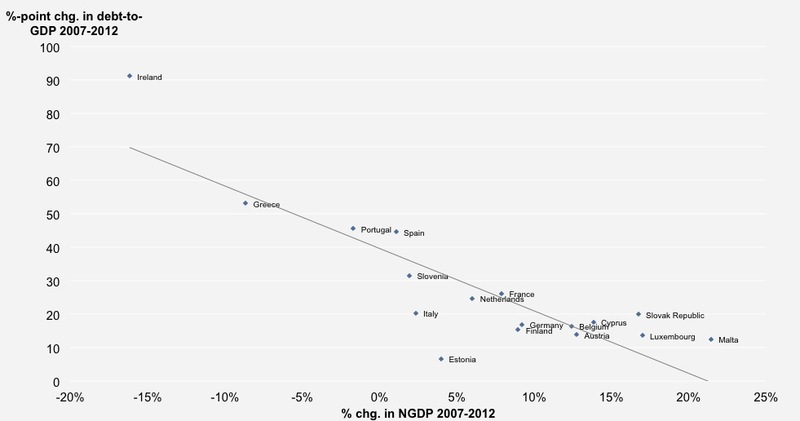 Greece is smack on the regression line in the graph – and so is Germany. The better debt performance in Germany does not reflect that the German government is more fiscally conservative than the Greek government. Rather it reflects a much better NGDP growth performance. So maybe we should ask the Bundesbank what would have happened to German public debt had NGDP dropped by 10% as in Greece. My guess is that the markets would not be too impressed with German fiscal policy in that scenario. It should of course also be noted that you can argue that the Greek government really has not anything to reduce the level of public debt – if it had than the Greece would be below to the regression line in the graph and it is not. There are two outliers in the graph – Ireland and Estonia. The increase in Irish debt is much larger than one should have expected judging from the size of the change in NGDP in Ireland. This can easily be explained – it is simply the cost of the Irish banking rescues. The other outlier is Estonia where the increase in public debt has been much smaller than one should have expected given the development in nominal GDP. In that sense Estonia is really the only country in the euro zone, which have improved its public finances in any substantial fashion compared to what would have been the case if fiscal austerity had not been undertaken. The tightening of fiscal policy measured in this way is 20-25% of GDP. This is a truly remarkable tightening of fiscal policy. Imagine, however, for one minute that Greece had undertaken a fiscal tightening of a similar magnitude as Estonia and assume at the same time that it would have had no impact on NGDP (the keynesians are now screaming) then the Greek budget situation would still have been horrendous – public debt would have not increase by 50% %-point of GDP but “only” by 30%-point. Greece would still be in deep trouble. This I think demonstrates that it is near impossible to undertake any meaningful fiscal consolidation when you see the kind of collapse in NGDP that you have seen in Greece. Concluding, the European debt crisis is not really a debt crisis. It is a monetary crisis. The ECB has allowed euro zone nominal GDP to drop well-below its pre-crisis trend and that is the key reason for the sharp rise in public debt ratios. I am not saying that Europe do not have other problems. In fact I think Europe has serious structural problems – too much regulation, too high taxes, rigid labour markets, underfunded pension systems etc. However, these problems did not cause the present crisis and even though I think these issues need to be addressed I doubt that reforms in these areas will be enough to drag us out of the crisis. We need higher nominal GDP growth. That will be the best cure. Now we are only waiting on Draghi to deliver. PS The graph above also illustrate how badly wrong Arthur Laffer got it on fiscal policy in his recent Wall Street Journal article – particular in his claim that Estonia had been got conducting keynesian fiscal stimulus. See here, here and here. The student driver obviously is fiscal policy, while the teacher is monetary policy. If the student (fiscal policy) try to take the car (the economy) in one direction the teacher (monetary policy) can always step in and overrule him. This is of course the Sumner Critique – monetary policy will always have the final say on the level of aggregate demand/nominal GDP and hence the fiscal multiplier is zero if the central bank for example targets the nominal GDP level or inflation and that is even the case if the world is assumed to be Keynesian in nature. Blinder here raises an interesting question – what if the central bank does not conduct monetary policy in a proper fashion wouldn’t it then be better to give the fiscal authority the possibility to try it’s luck. Blinder is of course right there is no guarantee that the central bank will do a good job – if that was the case then we would not be in this crisis. However, does that mean that fiscal policy can “take over”? Obviously not – even a bad central bank can overrule the fiscal authority when it comes to aggregate demand. The ECB is doing that on a daily basis. Anyway, I really just wanted to remind my readers of Blinder’s paper. It is really not directly about the Sumner Critique, but rather Alan Blinder is discussing coordination between monetary policy and fiscal policy from a game theoretical perspective. Even though Blinder obviously as a lot more faith in “government design” than I have the paper is quite interesting in terms of the games central banks an governments play against (and sometimes with) each other. I find Blinder’s discussion highly relevant for particularly the game being played in the euro zone today between the ECB and European governments about monetary easing versus fiscal consolidation. William Nordhaus in 1994 wrote a similar paper to Blinder’s about “Policy Games: Coordination and Independence in Monetary and Fiscal Policies”. Nordhaus’ paper is equally relevant to today’s discussion. It seems like the game theoretical literature about monetary-fiscal policy coordination has somewhat disappeared today, but to me these topics are more relevant that ever. If my readers are aware of any newer literature on this topic I would be very happy to hear about it. PS the literature apparently not completely dead – here is a 2010 dissertation on the same topic by Helton Saulo B. Dos Santos. I have not read it, but it looks quite interesting. Update: Nick Rowe has kindly reminded me that he and Simon Power actually have written a paper on the same topic back in 1998. Nick recently did a blog post about his paper. Nick interesting enough reaches the same conclusion as I do that in a Stackelberg setting where the government sets the budget deficit first and the central bank follows and determine NGDP we get a outcome similar to the Sumner Critique. Again this is not due to monetarist assumptions about the structure the economy (the LM curve does not have to be vertical), but rather due to the game theoretical setting. One of the hottest political topics in the US today is the so-called fiscal cliff. The fiscal cliff is the expected significant fiscal tightening, which will kick in January 2013 when the Tax Relief, Unemployment Insurance Reauthorization, and Job Creation Act of 2010 expires – unless a deal is struck to postpone the tightening. The fiscal cliff is estimated to amount to 4% of GDP – hence a very substantial fiscal tightening. So how much should we worry about the fiscal cliff? Keynesians claim that we should worry a lot. The Market Monetarist would one the other hand argue that the impact of the fiscal cliff will very much depend on the response of the Federal Reserve to the possible fiscal tightening. If the Fed completely ignores the impact of the fiscal cliff on aggregate demand – if there will be any – then it would be naive to argue that there would be no impact at all on aggregate demand – after all a 4% tightening of fiscal policy in one year is very substantial. On the other hand if the Federal Reserve had an NGDP target then the impact would likely be minimal as the Fed “automatically” would fill any “hole” in aggregate demand created by the tightening of fiscal policy to keep nominal GDP on track. This of course is the Sumner critique – the fiscal multiplier will be zero under NGDP targeting or inflation targeting for that matter. Note that I am not making any assumptions about the how the economy works. Even if we assume we are in a Keynesian world, where the “impulse” to aggregate demand from a fiscal tightening would be negative an NGDP targeting regime would ensure that the world would look like a “classical world” (fiscal policy will have no impact on aggregate demand). This by the way would also be the case under inflation targeting – which of course is closer to the actual policy the Fed is conducting. Said in another we should expect that if fiscal policy indeed would be strongly negative for aggregate demand in the US and push inflation sharply down then the likelihood of more aggressive monetary easing from the Fed would increase and hence sharply reduce any negative effect on aggregate demand (note that nominal GDP is really just another word for aggregate demand – at least according to Market Monetarists like myself). Therefore, we should probably be significantly less worried than some Keynesians seem to be. Furthermore, it is notable that the US stock market continues rise and inflation expectations have been inching up recently. This is not exactly an indication that the US is facing a sharp drop in aggregate demand in 2013. We can obviously not know why the markets seem so relatively relaxed about the fiscal cliff, but I would think that the reason is that the markets are pricing in a combination of a political compromise that significantly reduces the fiscal tightening in 2013 and also is pricing an increased likelihood of QE3 becoming a reality. So the conclusion is that Keynesian fears about the scale of the shock to aggregate demand is somewhat overblown as a combination of the Sumner critique and political logrolling will probably reduce the negative shock. We, however, can’t be sure about that so wouldn’t it be great if we didn’t have to worry about this issue? NGDP level targeting could seriously reduce the worries about fiscal shocks. Both in the US and the euro zone calls for scaling back fiscal consolidation have been growing larger and politicians like the French President Hollande and from Keynesian economists like Paul Krugman and Brad DeLong have even demanded fiscal stimulus. To me it is pretty simple – the state of public finances in most euro zone countries and the US is horrible so I fundamentally don’t think that most countries can afford much fiscal stimulus. That said, I also think that the calls for austerity is somewhat hysterical and I find it rather unlikely that the markets would react very negative if the US budget deficit became 1-2 percentage points of GDP larger next year – just look at US treasury yields it is not so that the markets are telling us that the US economy is on the verge of bankruptcy. The markets are often wrong, but government default rarely happens out of the blue. However, from a public choice perspective we should probably think that the deeper a country falls into recession the more likely it is that the wider public will vote for politicians like Hollande and policy makers are more and more likely to start listening to economists like Paul Krugman. That unfortunately will do very little to ending the crisis. Fiscal stimulus is not the answer to our problems – monetary easing is. So fiscal conservatives are likely going to face more and more resistance – whether we like it or not. On the other hand if the central bank was operating a credible NGDP level target then fiscal conservatives could argue that negative impact of fiscal consolidation would be met by an easing of monetary policy to keep NGDP on track. Therefore there would be no reasons to worry about fiscal tightening hitting growth and increasing unemployment. Even better imagine that the Federal Reserve tomorrow announced that it would do as much monetary easing needed to bring back NGDP to its pre-crisis trend by for example raising NGDP by 15% from the present level by the end of 2013. Do you then think anybody would worry about a fiscal tightening of 4% of GDP? I think not. Therefore, the conclusion is clear to me. Fiscal conservatives should endorse NGDP level targeting as it completely would undermine any Keynesian arguments for postponing fiscal consolidation. Furthermore, a commitment to keep NGDP on track would also likely make fiscal consolidation much less unpopular and therefore the likelihood of success would also increase. PS Above I have not given any attention to the supply side effects of the “scheduled” tax hikes that follows as a result of the US fiscal cliff. NGDP level targeting would not deal with that problem and the issue should certainly not be ignored. Tax hikes can never increase the long-term growth potential of any economy, but the issue is not going to have any visible impact on real GDP growth in 2013 or 2014 for that matter. Supply side effects mostly work with long and variable lags. Furthermore, I am not arguing that one should ignore the fiscal cliff just because the Fed has the power to counteract it. After all the Fed’s performance in recent years has not exactly been impressive so a political compromise would probably be helpful for US growth in 2013 – at least it would reduce some risks of the US falling back into recession. PPS this is my blog post #400 (including guest posts) since I started blogging last year. Is Matthew Yglesias now fully converted to Market Monetarism? The Independent Institute is out with a new book edited by our own David Beckworth: Boom and Bust Banking: The Causes and Cures of the Great Recession. David of course is one of the founding father of Market Monetarism and despite the somewhat Austrian sounding title of the book the book is primarily written from a Market Monetarist perspective. I must stress that I have not read book yet (even though I have had a sneak preview of some of the book), but overall the book splits three ways: (1) How the Fed contributed to the housing boom, (2) How the Fed created the Great Recession, and (3) How to reform monetary policy moving forward. “Congress created the Federal Reserve System in 1913 to tame the business cycle once and for all. Optimists believed central banking would moderate booms, soften busts, and place the economy on a steady trajectory of economic growth. A century later, in the wake of the worst recession in fifty years, Editor David Beckworth and his line-up of noted economists chronicle the critical role the Federal Reserve played in creating a vast speculative bubble in housing during the 2000s and plunging the world economy into a Great Recession. As commentators weigh the culpability of Wall Street’s banks against Washington’s regulators, the authors return our attention to the unique position of the Federal Reserve in recent economic history. Expansionary monetary policy formed the sine qua non of the soaring housing prices, excessive leverage, and mispricing of risk that characterized the Great Boom and the conditions for recession. Yet as Boom and Bust Banking also explains, the Great Recession was not a inevitable result of the Great Boom. Contrary to the conventional wisdom, the Federal Reserve in fact tightened rather than loosened the money supply in the early days of the recession. Addressing a lacuna in critical studies of recent Federal Reserve policy, Boom and Bust Banking reveals the Federal Reserve’s hand in the economy’s deterioration from slowdown to global recession. Other founding fathers of Market Monetarism such as Scott Sumner, Nick Rowe, Josh Hendrickson and Bill Woolsey all have also contributed to the book. Furthermore, there are chapters by other brilliant economists such as George Selgin, Larry White and Jeff Hummel. I think it is very simple – just buy the book NOW! (Needless to say my copy is already ordered). Bill Woolsey and Marcus Nunes also comments on the book. Last week we got GDP numbers for Q2 in both the Czech Republic and Hungary. Both countries plunged deeper into recession and as it is the case in most other countries in Europe the cause of the misery is monetary disorder. This is documented in two news pieces of research. One on Hungary by Steve Hanke and one the Czech Republic by myself. Both pieces of research are actually more traditional monetarist in nature than market monetarist as the focus in both papers are on the lackluster growth in the broad money supply rather than on nominal GDP or on market pricing. However, the same analysis could easily have been conducted by looking at nominal GDP rather than the money supply. Even though the two countries are similar in many ways – population size (around 10 million), economic development (transitional economies, middle income economies) and monetary policy regimes (inflation targeting and floating exchange rates) – there are also many differences such as the level of indebtedness (Hungary is high indebted and the Czech Republic have low levels of public and private debt). I think both countries are highly interesting in terms of understanding the present global crisis. The Czech Republic is in a deep recession and is showing no signs of recovery and seems to be caught in a disinflationary trap. While many argue that the present global crisis is a “balance sheet recession” or a natural hangover after a too wild party that can hardly be argued for the Czech Republic. The country has quite low levels of private and public debt and the banking sector is quite healthy compared to most European economies. So it is hard to argue that the Czech recession is the result of too much debt or a bursting property market bubble. There is really only one cause: A failed monetary policy. I try to document that in the paper I have written in my day-job as head of Emerging Markets research at Danske Bank. Read the paper “Time for the CNB to take bold action” here. I have for some time seen Hungary as the odd man out in Europe as Hungary’s main problem at the moment in my view is not monetary, but rather a deeper structural problem. Hungary has basically not seen any economic growth since 2006 and despite of that inflation has continued to run well above the Hungarian central bank’s inflation target of 3%. This to me is an indication of significant supply side problems in the Hungarian economy. The main supply side problem in Hungary is massive political uncertainty and a highly erratic conduct of economic policy. Hence, political uncertainty has dominated all economic decisions in Hungary for at least a decade. Hungary is probably the best example in Europe of what Robert Higgs has called “regime uncertainty”. Regime uncertainty basically mean that political and institutional uncertainty – such as uncertainty about tax rules – hampers investments and general entrepreneurial activity and therefore lowers productivity growth. Regime uncertainty therefore is a supply side phenomena. I strongly believe that this is at the core of Hungary’s lack of growth in that last 6 years. That said, I also agree that particular since 2010 monetary conditions have become tighter in Hungary and the monetary contraction has become especially nasty in the last six months of so. “When monetary and fiscal policies move in opposite directions, the economy will follow the direction taken by monetary (not fiscal) policy – money dominates. For doubters, just consider Japan and the United States in the 1990s. The Japanese government engaged in a massive fiscal stimulus program, while the Bank of Japan embraced a super-tight monetary policy. In consequence, Japan suffered under deflationary pressures and experienced a lost decade of economic growth. This is of course is two examples of the so-called Sumner critique, which I discussed in recent post on German monetary and fiscal policy after the German reunification. I agree with Steve – the reason for lack of growth in the Hungarian economy is not due to fiscal tightening. It is due to supply side problems – massive regime uncertainty – and recently also due to an unwarranted tightening of monetary conditions. So yes, the recent drop in economic activity in both the Czech Republic and Hungary is certainty due to a renewed monetary contraction, but while I think the “fix” is it pretty simple for the Czech Republic (ease monetary policy aggressively and soon) I am more skeptical that monetary easing alone will provide a lot of longer lasting help for the Hungarian economy. Hungary desperately needs to improve the general investor climate and implement real supply side reforms and most of all there is a need to reduce regime uncertainty. One might add that the tight monetary conditions in the Czech Republic likely is also creating supply side problems as the Czech government has reacted to the deterioration of public finances caused by low growth by sharply increasing taxes. Supply side problems and tight monetary policy is hardly a combination that gets you out of recession. I have recently written a number of posts (here and here) in which I have been critical about Arthur Laffer’s attempt to argue against fiscal stimulus. As I have stressed in these posts I do not disagree with his skepticism about fiscal stimulus, but with his arguments (and particularly his math). It is therefore only fair that I try to illustrate my view on fiscal stimulus and why fiscal stimulus (on it own) is unlikely to work. My view of fiscal policy is similar to that view Scott Sumner as articulated in what has been called the “Sumner critique”. According to the Sumner critique if the central bank for example targets inflation or nominal GDP any action by the government to “stimulate” aggregate demand will only work if it does not go counter to the central bank’s nominal target. Imagine that the central bank is targeting 2% inflation and inflation and expected inflation is at exactly 2%. Now the government in an attempt to spur growth increases the government spending by 10%. In a normal AS-AD model that would shift the AD-curve to the right from AD to AD’ as illustrated in the graph below. The increase in government spending will initially increase real GDP (output) from Y to Y’, but also push up the price level from P to P’ and hence increase inflation. However, as the central bank is a strict ECB type inflation targeter it will have to act to the increase in inflation by tightening monetary policy to push back the price level to P (yes, yes I am “confusing” the level of prices and growth in prices, but bare with me – I might just have written the whole thing in growth rates or argued that the central bank targets the price level). Hence, once the government announces an increase in government spending the central bank would announce that it would reduce the money base (or the growth rate in the money base) to counteract any impact on inflation from the “fiscal stimulus”. The reduction in the money base would push the AD curve back to AD. This is the Sumner critique – the government can not beat the central bank when it comes to aggregate demand. The central bank will ultimately determine aggregate demand and if the central bank targets for example inflation, the price level or nominal GDP then fiscal policy will have no impact on aggregate demand and note that this is even the case in a situation where unemployment is above the natural rate of unemployment. Hence, we have full crowding out even in a model with sticky prices and wages and underutilization of production factors (involuntary keynesian unemployment). Furthermore, if the inflation target is credible then investors will realise that any fiscal expansion will be counteracted by a monetary contraction. Therefore, once the fiscal expansion is announce the markets would react by starting to price in a monetary contraction – leading to a strengthening of the country’s currency, falling stock markets and lower inflation expectations – this on its own would counteract the increase in aggregate demand. This is the Chuck Norris effect in fiscal policy. Obviously in the real world neither monetary policy nor fiscal policy is ever 100% credible and there will always be some uncertainty about the scale and commitment to fiscal expansion and uncertainty about the central bank’s reaction to the fiscal stimulus. However, anybody who have follow developments in the euro zone over the past two years will realise that “promises” of fiscal austerity have been led to a rally in the stock markets (and fixed income markets in the PIIGS countries) as the markets have priced in the impact on aggregate demand of the expected monetary easing from the ECB. This is the reverse Sumner critique – fiscal tightening will not lead to a drop in aggregate demand if the markets expect the central bank to “cover” the short-fall in aggregate demand. Hence, I think that the Sumner critique is highly relevant for the discussion of fiscal policy today both in Europe and the US. Below I will try to illustrate the Sumner critique with an episode from recent economic history – the German reunification. After the fall of the Berlin wall in 1989 West Germany and East Germany was reunified. Due to the nature of the collapse of communism in East Germany the reunification of Germany happened extremely fast. Hence, most economic-political decisions were highly influenced by political expediency and geo-political and electoral concerns rather than by rational economic considerations. One such decisions was the imitate political unification of the two Germanys. In fact East Germany was “absorbed” into West Germany. That for example mend that all social benefits and pensions etc., which were available to West German immediately (or more or less so) became available to East Germans and more or less from day one the benefit levels became the same in the entire unified Germany. This obviously led to a rather sharp increase in German government spending. The unification obviously also led to other forms of increases in public spending – for example the Capital was moved from Bonn to Berlin. It is always hard to estimate how large a fiscal expansion is as the budget situation is not only influenced by discretionary changes in fiscal policy, but also by so-called automatic stabilizers. However, judging from calculation made by the Bundesbank (in the 1990s) the fiscal expansion due to reunification was substantial. In 1989 the cyclical adjusted budget surplus was around 1% of GDP. However, after unification the budget swung into a deficit. In 1990 the cyclical adjusted budget deficit was 2.5% GDP and in 19991 it had increased to 4.2% of GDP. Hence, the fiscal expansion from 1989 to 1991 amounted to more than 5% of GDP. This by any measure is a substantial fiscal easing. It is very hard to assess what impact this strong fiscal easing had on the German economy – among other things because the Germany of 1989 was not the same country as the Germany of 1990 and 1991. Furthermore, this fiscal easing coincided with significant monetary easing as it controversially was decided to exchange one East Mark for one West Mark. That led to a rather substantial initial increase in the unified Germany’s money supply. However, while it can be hard to assess the direct impact on growth from the fiscal expansion it is much easier to assess the German Bundesbank’s reaction to it. The Bundesbank was horrified by the scale of fiscal expansion and the potential inflationary consequences and the Bundesbank did not led anybody doubt that it would have to tighten monetary policy to counteract any inflationary consequences of the unification. Secondly, it also pushed strongly for the German government to fast tighten fiscal policy to reduce the budget deficit. Hence, market participants from an early stage would have had to expect that the Bundesbank would tighten monetary policy and that it would “force” the government to tighten fiscal policy. This in many ways is the exact same thing we see in the eurozone today, where the Bundesbank dominated ECB is telling policy makers if you don’t tighten fiscal policy then we will effectively allow monetary conditions to become tighter. Already in 1991 the Bundesbank moved to counteract perceived inflationary risks and started tightening monetary policy. In a series of aggressive interest rate hikes the Bundesbank increased its key policy rate to nearly 10% in 1992. In that regard it should be noted that the Bundesbank hiked interest rates at a time when global growth was weak due among other things a spike in global oil prices in connection with the first Gulf war. Furthermore, the Bundesbank also put significant pressure on the German government to tighten fiscal policy, which it did in 1992. There is no doubt that the Bundesbank wanted to demonstrate its independence to the government and probably for exactly that reason chose to be even more aggressive in its monetary tightening that was warranted even according to its own thinking. As a consequence of disagreement between the German government and the Bundesbank the governor of the Bundesbank at the time Karl Otto Pöhl resigned in October 1991 after having initiated monetary tightening. The monetary tightening in 1991-92 not only sent Germany into a deep and prolonged recession it also was the direct cause of the so-called EMS crisis in 1992-93. This particular episode in German (and European) monetary history is a powerful illustration of the Sumner critique. It is pretty clear that even substantial fiscal easing (around 5% of GDP) did not have long lasting impact on growth in Germany due to the Bundesbank’s counteractions to curb the perceived (!) inflationary risks. I do not claim to have proven that the fiscal multiplier is zero, but I hope I have demonstrated that it is that it is unlikely to be positive if the central bank does not play along. In the case of Germany in the early 1990s the fiscal multiplier was probably even negative as the Bundesbank decided to punish the German government for what it perceived as irresponsible policies. Anybody who is following the political struggle among European governments and European central bankers would have to acknowledge that it is very similar to the situation in Germany after the reunification. Consequently I think it can be concluded that monetary policy will never be able to lift aggregate demand if the central bank refuse to do so – and that will often be the case if the central bank is worried about its credibility and independence. I am no Calvinist and I tend to think that some of the calls from certain economists for austerity is rather hysterical given our problems particular in Europe primarily are monetary, however, I do think that the Sumner critique is highly relevant and we under normal circumstances (that is circumstances where the central bank for example pursues an inflation target) should expect the fiscal multiplier to be close to zero. We all of course also know there are numerous other problems with fiscal easing – for example any temporary increase in public spending seem to become permanent and that is hard good for long-term growth in any economy, but that discussion is more or less irrelevant for the present crisis, which in my view mostly a result of misguided monetary policies rather than failed fiscal policies.